The Magic of the Pentacle - What is a Pentacle? There is a lot of confusion about the simple pentacle - what it is, what it means, and how it is used in Wicca. What is a Pentagram vs a Pentacle? Often used interchangeably, there actually is a difference between the two terms: Pentagram and Pentacle. 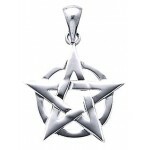 A pentagram is a 5 pointed star and literally means "five lines" from the Greek word pentagrammos. It is a geometric shape and by itself, can really just be a star though can take on spiritual meaning depending on your path and the context in which it is used. The pentacle is a pentagram surrounded by a circle. While thought by some to be a New Age or Neo-Pagan symbol, the pentacle is actually a very ancient design. It is the pentacle which actually takes on the most meaning in Wicca, Witchcraft and other Pagan spiritual practices and has various meanings depending on the tradition and way it is used. For the sake of clarity, the Pentacle will be the focus of the rest of this article. What does the Pentacle Mean? This is an area for sometimes heated debate as the pentacle has been misunderstood and misrepresented for some time. Part of the confusion comes from the fact there is no one correct meaning of the pentacle. Like most ancient symbols, it has represented various concepts thru the years and been adapted and adopted by multiple spiritual traditions. Also like most things in Wicca, there is no right or wrong answer - you are free to decide what it means to you or the particular branch of Wicca/Paganism you follow. The Elements: Each point represents one of the major elements in nature and witchcraft: Earth, Air, Fire, Water and Aether or Spirit. Some say the circle represents the power of the witch to contain and control the elements. It is sometimes said that it represents the control of spirit over all creation - mind over matter. Circle of Manifestation: Related to the use of the elements, the pentacle is seen by some to be a manifestation tool allowing the star to act as a portal for spirits while the circle contains the spirit protecting the summoner and allowing the spirit to remain within our plane longer. On a smaller scale, a pentacle can be used to manifest things you want in your life and charge crystals or other ritual tools with your intent. Pentacles used this way are often found on the Wiccan altar. Divine Feminine: Some see the pentacle as the ultimate expression of womanhood with the open center of the pentacle representing the womb. Man (or Woman! ): Each point stands for head, 2 arm and 2 legs with the heart corresponding to the center of the pentacle. The circle represents mans place in the center of the universe. New Age Spirituality: In the 70s and 80s when Pagan paths started gaining press and more notoriety, the pentacle was generally used to stand for any of these spiritual, Neopagan paths, even if that tradition itself never used it. As such, some Neopagan practitioners have shied away from the pentacle using other symbols such as the Triquetra, Chalice, etc, in its place at least publicly though may still use a pentacle in private. Witchcraft (The Craft): While Witchcraft has no one symbol that represents it, mainstream media often assumes it does and uses the pentacle in a derogatory way. The pentacle is a tool used in some witchcraft and spellwork, it does not represent Witchcraft in general. Celestial Power: Some see the pentacle as a star overlaying the full moon making it represent the heavens and celestial energy. It can be used in this aspect to invoke universal energy. The so-called Inverted Pentacle with point down is where the pentacle begins to take on the aspect of "evil" to the uninformed and became an object of disdain to Christians and other religious groups. Some of these groups see any pentacle or pentagram as a symbol of evil which is why many Wiccans keep a pentacle they wear hidden or choose not to wear one at all. 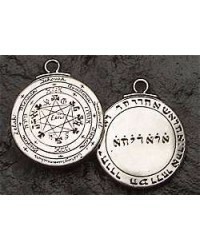 For Wiccans, who do not believe in Satan or the concept of Hell, the pentacle with point down or towards oneself symbolizes Elemental Energy brought down to you, as opposed to wearing it point up casting Elemental Energy outward. It is also associated with the Second Degree in formal training and has no relation to Satanism. 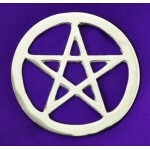 The two most common uses of the pentacle in Wicca are for manifestation and protection. In most Wicca traditions, the meaning of the pentacle is strongly associated with the elements: Earth, Air, Fire and Water along with Spirit (or the Gods) and how the energy of the elements combine to create all of nature. In this form, the Power of the Universe can be invoked for protection or to power rituals and spells for those that also practice The Craft. One of the first spells I learned uses just a piece of paper with your written intention folded and laid in the center of a pentacle paten or plate on your altar. When a circle is cast for Wicca or Witchcraft rituals, pentacles are often drawn in the air at the cardinal directions to invoke the assistance of the elemental powers: North for Earth, East for Air, West for Water, and South for Fire (some traditions change these directions). Pentacles can also be drawn on windows, doors, and magical tools - often with oils or blessed water - to invoke the power and protection of the elemental forces. It is a common practice during home cleansing and blessings to trace a pentacle onto each door or window using salted water for instance. Pentacles may be combined with other symbols such as runes or stones to focus its power for a specific purpose - a prosperity spell I know includes the creation of a pentacle in cinnamon (a herb associated with prosperity) that it then "sent out to the universe" by blowing the herb off the altar. 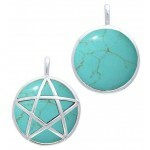 Gemstones are often added to pentacle jewelry to amplify its power. 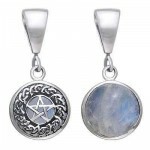 If you choose to wear or use a pentacle, you should decide what it represents to you. Since Wiccans are not held to any formal belief system, it can represent whatever you, your coven, or specific path you follow decides it means. Like all things in Wicca, it should be used with intent and respect, so take some time to decide what the pentacle means to you. When you are considering something to empower (or enchant if you want to use a more magical sounding term), consider what you want it to do..and look at the design to see what it says to you. Then learn how to charge or empower it for that purpose. 0 Comments To "The Magic of the Pentacle - What is a Pentacle?"